I have been pondering a great and devastating mystery this morning. The mystery of the unanticipated passing of a loved one. One thing I know for certain is that the abrupt and unexpected death of someone we love is earth-shattering. The event will make you numb and send you reeling into shock when it happens. I also know that there is a difference as wide as The Grand Canyon, between those who grieve with faith and hope and those who do not. We saw this illustrated within the walls of a Virginia home this past week. On Wednesday, my husband and I traveled over 600 miles round trip to the quaint, historical town of Abingdon to sit with best friends we have been close to for 38 years. Their son passed away on Saturday, March 7, 2015. Our hearts are aching and we are trusting that we can somehow be an encouragement in the days, weeks, and months ahead as we walk this unfamiliar path with them. When I planned my last post entitled, Choose Not To Be Blue, and now this Part Two post, the sudden death of this much-loved young man, Taylor Heston Read, had not yet happened. This post is not about our best friends’ son leaving us so suddenly—that subject is far too raw and heartbreaking just now. Our constant prayers for comfort lie with the bereaved, Paul, Kelly, Megan, five grandparents, and the countless others who knew and loved this kind and gentle soul. Thank you for joining us in this prayer. Rest In Peace, Taylor, and we will see you again. Rather, I will share a story that is dear to my heart which in my view, demonstrates so well the important life lesson my Mama stressed to us as we were growing up: When you are feeling down and out, help someone. The date was August 5, 2005, when my dear friend Jil drowned in an Alabama lake while her family was with her. They were delighting in the final hazy, lazy days of summer when she slipped away. Jil was 40 years old. Jil Cain was one of those humans who inspired others to laugh and love. Jil is still remembered and missed by multitudes of people, even nearly 10 years following her passing. Jil left a memorable legacy behind for her family and friends. A life-changing book was shared with me just after Jil’s passing: A Grace Disguised. Joan and Jil take a break during the Avon 3-Day 60 Mile Walk in support of Breast Cancer Research, October 2000, Atlanta, Georgia. My memory bank holds many, many sweet images of Jil, one of which was our participation, along with my girlfriend Kathy, in an Avon 3-Day 60 mile Breast Cancer Walk together in 2000. With the help of my friend, Jules Furr, I was able to raise over $6,000.00 and I walked in memory of my teaching friend, Debbie Ledford who had died in late 1999 of cancer. Leah and Walker even held a dog-wash to raise funds. : ) Throughout this weekend in 2000, Jil, Kathy and I were surrounded by survivors at every turn. The 60 mile journey was an incredibly inspiring experience. A stirring of the soul. Later in the month, soon after Jil had died, I was driving aimlessly down the road. Our children were at Wednesday night youth group, my husband was working, and I was falling into the depths of despondency as I grieved the loss of my 40-year-old girlfriend. Suddenly, I remembered this important lesson that my mother had always told me. Mama had often modeled this lesson as well. Tragically, Hurricane Katrina and the broken levies had just flooded New Orléans. In the nearby Boots Ward Recreational Center, there was a Red Cross shelter, a safe haven for some of the Katrina evacuees. I drove straight to this center and found out that there was a volunteer position available for the following Monday, 6-10 a.m. I signed up and felt the sadness start to ease. The following morning, I arrived at my appointed time, unaware that someone was about to be placed in my path who would change my life. I soon met Sarah L. Johnson, a Katrina evacuee who had resided in New Orléans her entire life. Sarah was 85 years old, had never married, and had no children. Funny, she said she had always wanted to visit Atlanta, but didn’t realize she would come like this. The story of how she got here is a story in and of itself. After the initial evacuation, though there was a power outage, Sarah and her fellow residents were returned to their apartments. When she heard banging on her door, she glanced out the window only to see water rushing into the streets and rising rapidly. We now know that the levies had broken down, but at that time, the residents had no idea what the rushing water was from. They were hurried to the roof of the building where they stayed overnight until a helicopter could pluck each one of them off the roof. When boarding the helicopter, in all the confusion, this 85-year-old woman lost her walker, her glasses, her shoes, and worst of all Sarah was separated from a friend who was holding all of her IDs for her. My new friend, Sarah, at the Red Cross shelter. My friend, Vicki, who also helped Sarah Johnson during her unexpected, unplanned trip to Georgia in 2005. Sometimes our greatest disappointments are God’s appointments to be a blessing in someone else’s life. A friendship soon developed with Sarah which would change my life for evermore. When I first met Sarah, she was just waking up in the Red Cross Shelter. I helped Sarah with her laundry, got her breakfast. She talked with me about her strong faith in God and how surely God had a plan for her even in this crazy situation. Feeling more encouraged, at the end of my shift, I gave her a hug, thinking I’d never see her again this side of heaven. Cathy and Sara with Sarah Johnson, who joined us for our weekly Bible Study in my friend Sara’s home. A few days later, I received a phone call from my friend, Vicki, who had worked at the same shelter, telling me that Sarah needed to see a cardiologist and could I help her to get in to see someone. I had the privilege of taking her to a doctor the very next day. Her heart was just fine and this was the beginning of a sweet friendship, one that I will forever cherish. 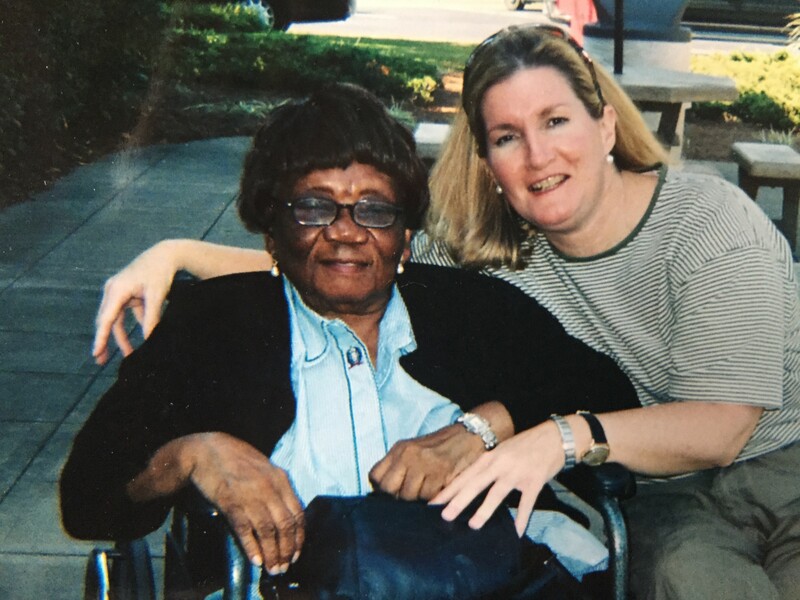 After four weeks at the shelter, Sarah moved to a wonderful nearby assisted living facility where even though she was the only African American woman there, she was embraced by the other residents. She worshipped with us at our church and even gathered at my sister’s home for a huge family lunch! 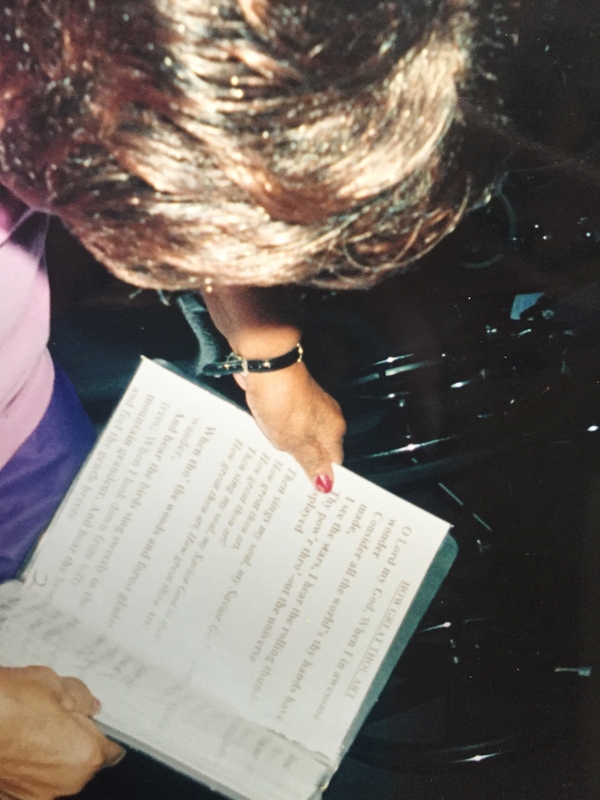 She shared her heart with me and told me why PSALM 27 was her mainstay scripture. Mama and I took her to the Martin Luther King Center in Atlanta and she told Mama and me all about her personal and vivid memories of the Civil Rights Movement. Our daughter, Leah, with Sarah in Aunt Mary Ann and Uncle Jim’s home as we gathered after church for a Sunday lunch. Later, Sarah was happily returned to New Orléans to her same first floor apartment. I believe that our God gave me this opportunity to serve and help Sarah during a time when my heart was broken over the loss of my precious friend Jil. So if you are feeling down and going through a great disappointment today, look up and all around. Watch for the appointment that may be waiting around the corner for you to be an uplifting messenger to someone today. Sarah L. Johnson sings “How Great Thou Art” at Wellington Place Retirement Home before returning to New Orléans. My beautiful and loving friend, Kelly Marie Heald Read, gives me an encouraging hug on March 29, 2014, my day to be a Mother of the Bride. We’ve been holding each other up, leaning on each other in faith since 1976. Joan, what a lovely and touching story! As always thank you for sharing. Thank you Joan ……you are such an inspiration to me and I love your Blog. You bless every life that you touch! this was beautiful to read Aunt Joan! I do think that sometimes the way you mend heartbreak is to help the heartbroken. Love you!